According to the Audubon Society, if you have a birdfeeder the birds should be fed year round, but since I winter in New York there is an extended period when my birdfeeder is empty—waiting for the spring thaw. Some humans have experimented with this esoteric diet, namely; eating for six months of the year then fasting for six months, but since the test group did not survive the fast the FDA (Fast Diet Approach) failed to approve the plan which eventually went to seed. In summer, the bird feeder is a hub of activity with a clearly defined pecking order. First to arrive are the Blue Jays, who attack the newly filled bird feeder searching for black oil sunflower seed. If the seed mix also contains cracked corn the ravens claim priority and not even the Blue Jays exhibit the courage to quarrel with a raven especially when the raven Quoths “Nevermore!” Once the big guys exit a flock of barn finch swoops in for nyjer seed. On a normal day my bird feeder empties by mid afternoon, even sooner if a visiting squirrel leaps from the porch roof and lands on the feeder. But, with the advent of winter, the feeding tube disappoints the aviary world. Can you imagine the feeling when the birds discover only a barren feeder? Amazement? Frustration? Anger? Who knows. And then one day—. 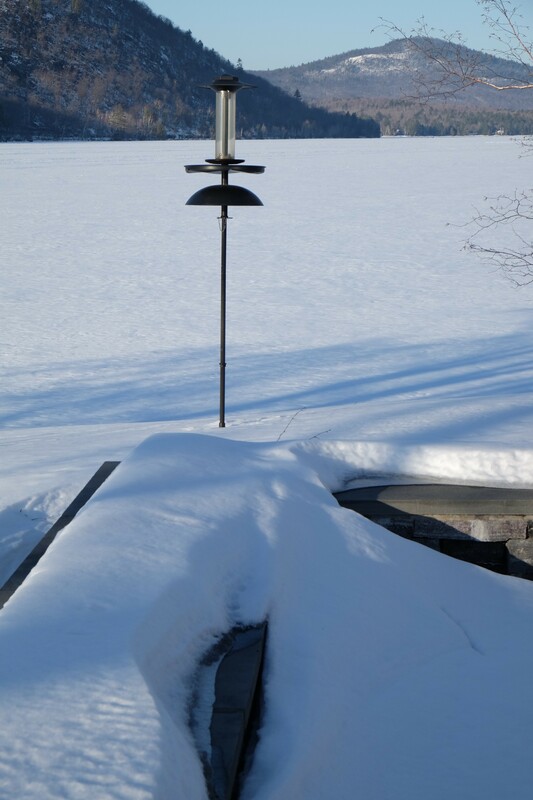 One day in late winter I visited my home at Brant Lake, hunkered in on the couch, next to a blazing fire, and stared out at the birdfeeder located on the terrace. I looked and I looked and what did I see? A bird sitting on the rungs of the empty bird feeder. A sparrow. Not one of the beautiful species in the bird kingdom. It was small, plump, and gray with a short tail. Compared to the bright colors of a yellow finch, or the rich orange of a grosbeak, or the red of a downy woodpecker, this sparrow was dull. Every morning the sparrow returned. Expecting breakfast? Sorry. Not until May. At first I failed to understand why this sparrow came back day after day but finally I understood. This bird represented hope, a wonderful quality in the gloom of winter. Hope, persistence and faith that the day would come when the bird feeder would again be chock full o’ seed and the stomach and spirit would be fed. The sparrow knew: Eventually spring will cover the land and the time of rebirth will arrive. March 26, 2017 in Brant Lake.